The woman who looked like my wife walked past the shop again. She stopped at the window. I was sure it was her, then sure it was not when she looked up and saw me watching. If she was surprised to see me she gave no sign. She went on looking in the window, then came in. The bell rang as she closed the door. I nodded, she said nothing: two strangers, a brief acknowledgement. She wandered around, went down to the basement. I watched her on the monitor. On the black and white screen she looked more like her old self. She bought a first edition of The Weather In The Streets. I wrapped it carefully. Again I couldn’t be certain. She was thinner. I looked her in the eye as I handed over the book. She held my gaze, hers betraying no sign of recognition. Perhaps she was ashamed to find me reduced to working in a bookshop. My sitting, her standing, the exchange of money: I couldn’t think of a question that didn’t sound ridiculous. I wondered if she had set out to ignore me, to humiliate me. Her unspoken message was: whether I was your wife or not, I’m a stranger now. 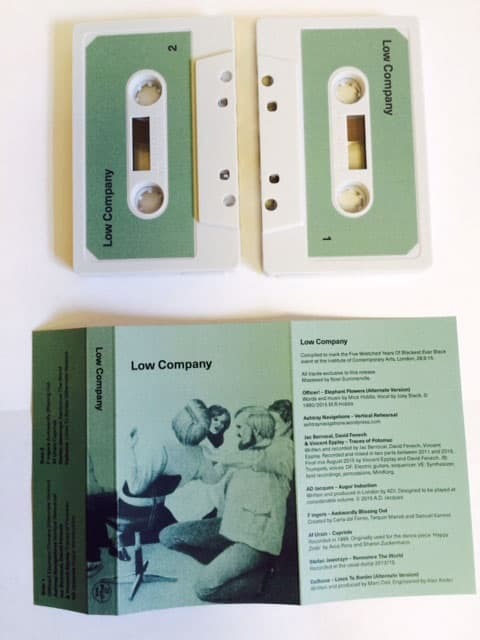 A special edition cassette compiled to mark the Five Wretched Years of Blackest Ever Black event at the ICA, London, on September 26, 2015. It features exclusive, previously unreleased tracks from all eight of the artists performing live at the event. Jac Berrocal, David Fenech & Vincent Epplay contribute ‘Traces of Potomac’, a companion piece to their Antigravity album; Ashtray Navigations give us the time-dilating ‘Vertical Rehearsal’, and Stefan Jaworzyn invites you to ‘Renounce The World’ (a perfectly nauseating synth and drum machine argument bridging the sounds of his archival BEB LP Drained of Connotation and his more recently hatched Shock EPs). Timo van Luijk aka Af Ursin, whose 2005 LP Aura Legato is soon to be reissued on Blackest Ever Black, supplies an impish miniature originally recorded for a 1999 dance commission, and AD Jacques makes his BEB debut with the stern low-end iterations of ‘Augur Induction’. ‘Lines To The Border’ is a reworked and extended version of a personal favourite from the forthcomingDalhous LP The Composite Moods Collection, and the exquisite, string-led version ofOfficer!‘s ‘Elephant Flowers’ was left over from the sessions for Dead Unique and receives its first public airing here. F ingers, meanwhile, exchange the claustrophobia of their Hide Before Dinner album for the Secret Dub Life of ‘Awkwardly Blissing Out’ – possibly our favourite work of theirs to date. Produced in a strictly limited edition of 150 – pro-dubbed with printed inlays and labels – the first opportunity to purchase this tape will be at the event itself. To buy tickets for the daytime session (which commences with a screening of Jane Arden & Jack Bond’s Anti-Clock and then live sets from AD Jacques, Dalhous, Stefan Jaworzyn, F ingers and Ashtray Navigations, with William Bennett DJ) click here; for the evening concert (Jac Berrocal, David Fenech & Vincent Epplay, Officer! and Af Ursin, with Raime DJs) go here. To buy a discounted day+evening ticket click on ‘multi-buy offer’ on either page. Pro-dubbed cassette, edition of 150. Mastered by Noel Summerville at 3345, London. Available to buy at the Five Wretched Years Of Blackest Ever Black event at the Institute of Contemporary Arts, London, 26.09.15. Any remaining copies unsold at the event will be available to buy from the Blackest Ever Black web shop on 28.09.15. Blackest Ever Black, on ne l’a pas assez dit, porte un nom qu’un Pierre Soulages convoiterait. On se dit que c’est d’autant plus pertinent que le label londonien, peuplé d’artistes du noir, célébrait récemment ses cinq ans en un lieu où Soulages aussi a toute sa place : l’ICA. Pour l’occasion, toute la bande pose sur cassette ce qu’il détient de plus reluisant parmi ses fonds de tiroir. Jac Berrocal, David Fenech & Vincent Epplay, Af Ursin ou encore F ingers, autant de noms adorés dont les pelures valent bien mieux que beaucoup de fruits.